Black Panther is the 18th film from the Marvel Cinematic Universe and it is, without question, the best movie they’ve made. That’s right—it doesn’t have 20 superheroes or threaten the end of the world, but it’s a cerebral and complex film that offers a breath of fresh air for the MCU. Director Ryan Coogler, who made Fruitvale Station and Creed, has created the most unique movie within the Marvel canon. He, along with the cast and crew ofBlack Panther, truly elevated the superhero genre. Black Panther follows T’Challa, played Chadwick Boseman, who after the death of his father (which takes place in Captain America: Civil War) must take his place as the new king of Wakanda. But, when a family secret emerges, the throne and Wakanda are put in jeopardy. One of the movie’s most significant accomplishments is that it’s one of the only Marvel films that can honestly stand on its own. Black Panther doesn’t need the MCU to exist because it’s so self-contained. It’s a focused picture which doesn’t need the 17 previous films to make sense. Where this film exceeds its predecessors is in its theme. While the MCU has continuously provided great action, solid comedy, and overall great popcorn-entertainment, Coogler’s movie is thematically-charged. It offers a depth that we’ve not seen in a Marvel installment yet. It also looks remarkably different. Rachel Morrison, who this year became the first woman to receive an Oscar nomination for Best Cinematography, is the first female to take on the role of cinematographer for a Marvel film. The look isn’t always vivid and comic-like, which we saw in movies like Thor: Ragnarok. It offers darker and grittier looking scenes in particular moments than breathtakingly clean in others. There is also incredible beauty found in the contrasting images of Oakland in the 90s, Wakanda, and this mystical realm/afterlife. Along with the new look comes a unique score that genuinely stands out as one of the picture’s strongest elements. 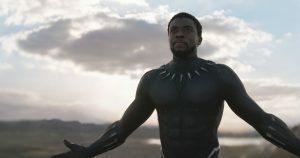 It has a dominating presence, inspired by African sounds and hip-hop, unlike anything we’ve ever heard in a Marvel movie. Beyond that, Black Panther offer some of the most badass women we’ve seen on the big screen. Where Marvel has been criticized for its lack of female superheroes, this pictures gives young girls plenty of role models: Shuri (Letitia Wright) is a technological genius who is the smartest person in the MCU. Then, there is Nakia (Lupita Nyong’o) who is an advocate and educator, and finally, there is Okoye (Danai Gurira) who is a warrior sworn to protect the throne. These women are truly the backbone of Coogler’s film, and their performances bring it to the next level. Now, with change always comes controversy. People are complaining because they don’t want “politics” in their movies. They want popcorn entertainment; they aren’t going to see movies to hear political messages. Well, luckily the MCU has 17 other films which they can watch. Film, like comics, and art in general, is meant to be a way to spread a message through a medium. So the idea the MCU can’t make films that address today’s political climate is ludicrous. Comics have been tackling controversial subjects nearly since their inception, so why wouldn’t the movie that reflects them? But, don’t get me wrong, Black Panther isn’t standing on a soapbox. They aren’t beating you over the head—it’s still a really fun movie. But, it’s a film that tackles both entertainment and heavy themes, with style. The movie challenges those who sit on their laurels while others are in desperate need of help and aide, but at the same time offer some of the most intriguing action set-pieces I’ve seen on screen in years. Again, it’s a movie that accomplishes many things all at once which is something the Marvel Universe hasn’t really done before. It offers fantastic performances from an all-star cast, fantastic action sequences, an unforgettable score, intelligent and challenging themes, a gorgeous and unique look, and arguably the most developed characters in the MCU has to offer. All in all, Black Panther is indeed the king of the Marvel Cinematic Universe.